Should I focus my collection on PSA 8's and 9's? I grew up collecting Baseball Cards as a kid in the 80's, and was part of that generation that saw the ups and downs of the market. I eventually sold my whole collection in the 90's after going to College. I've just recently got the itch to collect again and learning about the PSA Graded cards (something that didn't exist when I collected). Obviously everyone wants the perfect collection of PSA 10 cards, but the prices are just way out of my range for most cards. My focus will be on 1980's Rookie Cards and do you guys think it is smart to build my collection on PSA 8 and PSA 9? I want to say that I'm not collecting to resell in a few years as I want to build a collection to hand down someday to my kids and my nephews. Do most of the average collectors like me have a collection filled with PSA 8 and 9's? Do they hold their value well, because I assume the rich are buying the PSA 10's and everyone else is buying PSA 8 and 9's, so there will always be a market for them? Interested in everyone's thoughts and please correct me if you feel my opinions/assertions are way off base as I'm just getting back into collecting, so I'm learning all about the industry after 20 years. Last edited by stevecarlton1972; 06-17-2018 at 11:49 PM. I would recommend buying ungraded cards and storing them in penny sleeves and top loaders. If you are not selling them soon grading could be a complete waste of $. The grading companies are constantly changing slabs and flips. They have great marketing and always promote their latest and greatest form of their product. So when/if you do sell you want you cards in the latest greatest version of their product. I agree with bnorth, but also take pricing into consideration. Sometimes, you can purchase a graded 8 or 9 for the price of an ungraded copy. Someone may have an ungraded copy of X's rookie card for $5 + $3 shipping while another seller may have a PSA 9 for $10.00 with free shipping. In that case, I would purchase the graded one for the extra $2. I'd say it's case dependent. You yourself don't care about resell, you're buying for the pleasure and enjoyment of reliving your collection. But you said you also want something to pass down to your kids and nephews so future value is also a concern. Are you talking about an '86 Topps Traded Tiffany Bonds? Yeah, I would think PSA 8's and 9's will hold their value. Are you talking about an '87 Topps Bonds? No, I would not put any money into an 8 or 9. You get my point. There's no way to blanket all cards with one statement. I think you'll have to familiarize yourself with PSA's pop report and get a feel for what the thresholds are for certain cards at a certain level. That, combined with getting a feel for how much unopened product for that particular card is still out there will help you make your own educated guesses as to which grade and price point you're comfortable getting into. For the most part though, the general thought is that there was an infinity amount of product produced in the 80s so many people are only interested in PSA 10s for much of the regular issues. There are pros and cons to this. One of the pros is that there are issues that weren't produced in bulk that get swept up into the stigma and are available for great value now when you can find them. To Arthur's point, in my opinion where a Tiffany (or Glossy) version is available I would get that one. Most are pretty inexpensive relatively speaking, and the production numbers are a fraction of the regular issues. I would try to buy a PSA 9 of these cards first, but would settle for a PSA 8 if the price is out of my league (I know that an 82 Topps Traded Ripken will be more expensive then the 83 Topps Gwynn or Boggs . Does that sound like a good strategy? Last edited by stevecarlton1972; 06-18-2018 at 09:37 AM. Makes sense to me. Consider spending up though for a Tiffany Bonds, get a nice 8. And IMO Maddux and Johnson should be on that list. Last edited by Peter_Spaeth; 06-18-2018 at 09:54 AM. Definetly, as they were the rookies that came to mind. But as you said there are Maddux, Johnson, Alomar, and I have to go through each set to refresh my memory. I still remember the 86 Donruss Canseco was THE card to get when I was in High School, as I would like to see how that value has fallen from its peak in the early 90's? Last edited by Peter_Spaeth; 06-18-2018 at 10:15 AM. Okay, that makes sense. 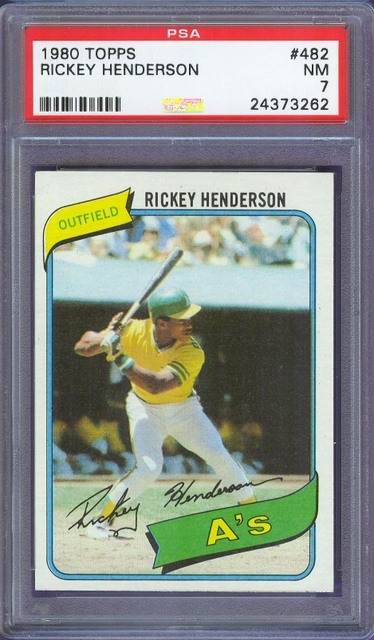 The Rickey, McGwire, and 83s are the toughest PSA 10s of the entire decade so going for 9s makes perfect sense. I think Peter is right though, go after an 8 Tiffany Bonds. The 80s are a slippery slope. I set out a few years ago to do what you're doing now. The list has grown exponentially but I've enjoyed every step of the way. Sweet cards, Arthur, especially the Leaf and OPC. I grew up in Vermont in the 80s and always hated running into the Canadian counterparts when trading, etc. But now I've done a 180 on them and quite enjoy them more than the Topps and Donruss varieties. Don't worry, my list has already gotten bigger over the weekend! It started very small with a select few cards that defined the decade (1980 Topps Ricky Henderson, 1989 Upper Deck Ken Griffey, etc), and now I keep adding this Hall of Famer and that Hall of Famer. And of course I have to find a Billy Ripken Fleer F**face, just because it was the one card that we all talked about in High School for a laugh! Last edited by stevecarlton1972; 06-18-2018 at 12:19 PM. Completely agree, Garth. I enjoy the added challenge of the Canadian versions as far as condition goes. Both the Bonds and McGwire were pack pulled and self-submitted by me. That Bonds is the best I've gotten out of almost 60 '87 wax boxes. I collect Cubs RCs from all eras. I use the PSA population report to decide which grades to pursue. I try to get cards that grade higher than 80% of the total pop. So for a 77 Andre Dawson that means a PSA 9. The total pop is 3,690, with 50 10s, 458 9s, 57 8.5s, and 1,529 8s. I assume my 9 is average for its grade, so that means there are (458/2)+50=279 cards graded higher than my card. Which means my card grades higher than 92% of the total pop of 3,690. The 8 would only grade higher than 64%, so 9 it is. Obviously older cards will mean a lower grade. The same math for a 33 Goudey Gabby Hartnett gets you a PSA 6. So you could use the same process, and adjust your target % to match your budget. 70%, 50%, whatever. As a general matter, what grade I buy is dictated by how much I want to spend on the player. So I will pay a lot more for RCs of players I consider elite all time greats (Clemens, Maddux, Bonds) than for players I just want to complete my HOF run (Larkin, Alomar, Biggio). Last edited by Peter_Spaeth; 06-18-2018 at 01:44 PM. Here is some more 80's eye candy in slabs. They are for sale as a lot if anybody is interested. For my 1980s/early-90s collection my goal for everything is a PSA 10. But I can be completely satisfied with a lesser grade if the right situation presents itself. I was able to get an '86 Traded Tiffany set for an obscenely low price and the Bonds came back a 9. So in that case, with getting the Bonds 9 for so cheap, that will probably cause me to not go for a 10 down the road. It just doesn't make sense financially. I think the only card I would completely write-off as a possibility at this point is the Rickey rookie. There's just so many other things I'd rather have along with a nice PSA 9 Rickey than one of the few PSA 10s. If you are set on a collection of slabs from this era, I would recommend PSA 9 grade examples. In the case of lesser stars you might be inclined to add, a PSA 10 may even be peanuts. 4 Sharp Corners is a great place for this stuff aside from eBay. Best of Luck re-entering the hobby! PS please share your spoils with us on this Board. I would go after the Henderson in 8 or better, the rest I'd try for raw. Frankly, the minute differences between grades on these post-1980 issues is frustrating for me. I don't see it and I don't care to see it. An 8 often looks just as nice as a 10 and there are tons of beautiful raw cards out there. I have almost none of them except raw. I think the goal should be to get cards that look undergraded rather than labeled a 10. Last edited by Exhibitman; 06-28-2018 at 03:41 PM. Every collector has their own see-saw to balance. On one end is fun and on the other end is future financial consideration. I can both relate and disagree with Adam's comment about the differences in grade. I've picked up some PSA 8 basketball cards from the 1970s that I feel like on any given day could have landed in a 9 or 10 slab. Yet, at the same time, I honestly cannot find a PSA 10 1989 Donruss Griffey that I'm happy with. Every single one is either pushing the centering limits for the grade or has a nasty white tip corner. I'm being 100% serious. It's been a many months pursuit. It all just boils down to one thing -- spend what you can afford to lose and have fun doing it. That's two things but I'm calling it one because shut up. That is where I am sort of confused about the PSA Grading. Now I know that centering isn't the only issue in grading a card, but I have seen PSA 8's better centered then PSA 9's on Ebay? I guess that goes back to my original question: PSA 8 seems to be in my price range for most rookie cards (Baseball, Hockey, Basketball, Football) from the 80's/early 90's. There are some PSA 9's that are in my range, but mostly PSA 8 seems to be right around my budget. Will I be happy with a Majority PSA 8 collection a few years down the road, or regret it? Again, I am not looking to buy and then flip these cards, but I still have the value in the back of my mind, and don't want a worthless PSA 8 collection when the majority of collectors are buying PSA 9 and 10 a few years from now? Or do PSA 8's sell just as well, just not to the high high end collectors? Last edited by stevecarlton1972; 07-03-2018 at 01:03 PM. Did you store your cards in binders as a kid? If you want to go the nostalgic route, get a decent binder, buy PSA 7s, crack 'em and put them in Ultra Pro sheets. Can probably get most of those cards for a few dollars each in PSA 7 (just be picky and wait for the right 6 or 7) and feel like a kid again as you hold the card and put it in a binder sheet. If you do go this route, don't confine yourself to just PSA. SGC and Beckett will also be available. It’s your collection focus on what you like. But if you are looking for investment advice. Stay away from 80s-90s stuff altogether and buy vintage 50s and back top tier players in extremely rare sets or extremely high grade. +1, except for the '87 Tiffanies. Production was known to be about 60,000 for those. Some good rookies in the '91's, which had a print run of 2-3,000, if you don't mind steroid guys (two of whom are now in Cooperstown). Really starting to appreciate many of the modern issues and having fun buying inexpensive, high quality, nicely designed baseball cards. Love the 50s and other vintage decades, but modern is a real nice guilty pleasure. Could not disagree more. While the market for those is there, investment at a high is huge risk. I think cards should never be an investment, but the currently building cycle of the next monied collector is in their mid fourties and starting to wind down the kid costs. As they reenter the market with more liquid cash they will start with the players they grew up with. It then takes an advance d collecting progression to dive into vintage with players you have only read about. The cards posted on this thread are going to just build in popularity. To the OP, enjoy your new found fun and the 8-9 talk in this thread will just be echoed by me..they are a great spot to look. +1 as to pretty much all of that, along with Peter's post re the Tiffany cards that follows. Except for 1987, where the Tiffany production number has been reported as 60,000 of each card, the production was generally much, much smaller than that. I truly love getting copies of the cards I coveted as a kid in high PSA grade. There's something richly satisfying to me about owning a 1986 Donruss Canseco, 1989 Ripken FF, etc in pristine condition. Enjoy, whatever grade you decide to purchase. I think you have gotten some really good advice and I hope your enjoying collecting whatever grade you ultimately decided to purchase cards in. I enjoy collecting the 80’s- early 90’s for all the reasons everyone else has given. Mostly as it reminds me of my youth and simpler times. I’m like Arthur that I collect most of my stuff in PSA 10 grades, but I also see real value in PSA 9 slabs by comparison to a PSA 10. If you have the means to collect in PSA 9, I believe that would be my advice to you. It’s a great mix of value and eye appeal. If your patient you can finds 9’s that look like 10’s all day long. Enjoy the journey! Arthur, those are gorgeous. That OPC Bonds looks like it could easily grade a 10. What specifically caused it to earn "only" a 9? With 60 boxes and a condensed Canadian set, what do you do with all the dupes? Are you trying to complete a graded set? OP, right now the OPC Bonds PSA 10 (pop 22) sells for around $2k and 3 PSA 9s (pop 90) sold recently for over $100 each and another 5 sold for exactly $100 each. Sometimes the grade probably does not justify the premium. 10s are approximately 5x as scarce but cost 20x more, when in many cases, a strong 9 may present better, or actually in real life be in better condition, than a weak 10. Last edited by RiceBondsMntna2Young; 10-25-2018 at 03:44 AM.